On 6th May 1953, at 6.10 a.m., a baby was born in Edinburgh. The baby’s name was Anthony Charles Lynton Blair. On the same morning, 6th May 1953, a 20-year-old R.A.F. engineer named Ronald Maddison walked into the military research establishment at Porton Down in Wiltshire. Maddison had volunteered to take part in some tests which, he had been told, were designed towards finding a cure for the common cold. In return for taking part in these tests, he had been promised fifteen shillings and three days’ leave. He planned to spend the money on an engagement ring for his girlfriend, Mary Pyle. Within 45 minutes of receiving the dosage of sarin, Maddison was dead. The sarin had blocked the flow of air into his lungs, depriving his brain and tissues of oxygen. Because the birth of Tony Blair and the killing of Ronald Maddison happened just four hours apart, the charts for the two events have a great deal in common. The rising signs, and the houses occupied by the planets, are different, but the signs occupied by the planets, and (in my view more importantly) the pattern of aspects between the planets (for all planets except the Moon) are the same in the two charts. It is my view that mundane charts (charts for the time of an event) are often descriptive of the mindset of the people who caused the event to happen. 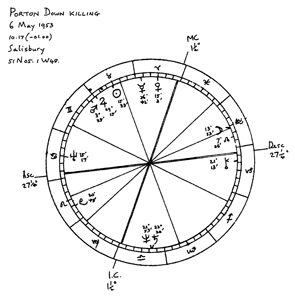 Thus, we can expect the chart for the Porton Down killing to describe the mindset, not of Maddison who was the victim, but of the scientists and researchers who killed him. And in fact, there are some striking similarities between the actions and motivations of the Porton Down scientists, and those of Tony Blair at the time of the climactic event of his career, which was the invasion of Iraq. Firstly, both the scientists and Tony Blair were carrying out a violent and unprovoked attack – in one case on an individual, in the other case on a whole country. Secondly, in both cases they were doing it because of their fear of the “enemy”: the scientists believed that the Russians were developing sarin which might be used against the West, and Blair believed that the Iraqis had “weapons of mass destruction” which (again) might be used against the West. Thirdly, both the scientists and Blair used deceit to make their actions possible. The scientists lied to Maddison that they were researching the common cold, since they could not otherwise have lured him to Porton Down. Blair misled the British parliament into believing that there was firm evidence of Saddam’s WMD, since the invasion could not have occurred without the consent of parliament. Of course, we cannot know for sure what was going on in the scientists’ minds. But I think we can assume that they, like Blair, believed totally in the rightness of their own actions, and believed also that the end justified the means. In other words, they believed that the violent death of an innocent man was justified by the importance of their research, just as Blair believed that the deaths of many thousands of Iraqi civilians (and of a smaller number of American and British soldiers) was justified by the need to disarm Saddam. So it would seem that the scientists and Blair were thinking and behaving in similar ways. 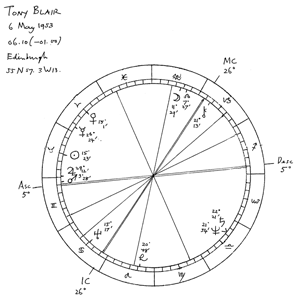 Astrologically, we can say that the scientists were responding to the “astral pattern” that was present in the sky at the time of their action; whereas Blair, fifty years later, was acting out the same pattern that had been imprinted on him at the time of his birth. What can we find in the two charts that would help to explain this pattern of behaviour? Here I must digress to explain the astrological methods which I personally follow. In 1983 I wrote a book, Harmonic Charts (3), describing the harmonic approach to astrology (following on the ground-breaking work of John Addey (4)). In the harmonic approach, the emphasis is on the aspects between the planets: not only the traditional aspects (conjunctions, oppositions, trines and so on), but also other aspects which are ignored in traditional astrology. For instance, we can look at quintiles (one-fifth or two-fifths of the circle), and also at aspects which represent subdivisions of the number Five (tenths, or fifteenths, or twentieths of the circle). These “Fiveness” aspects are shown by drawing the fifth-harmonic chart, in which quintiles are shown as conjunctions, deciles (tenths) are shown as oppositions, and so on. In the same way, we can draw a seventh-harmonic chart, or an eighth-harmonic chart, or a ninth-harmonic chart. Each of these will reveal a different pattern of aspects. The underlying belief is that each of the prime numbers (1, 2, 3, 5, 7 etc) represents a different quality or principle. In traditional astrology it is known that Twoness represents opposition, struggle, conflict, and Threeness represents pleasure, ease, harmony; but in harmonic astrology it is also believed that Fiveness is to do with building, structure, rationality, and Sevenness is to do with inspiration, wildness, intuition. Non-prime numbers, such as 15 which is 5 x 3, represent combinations of these qualities: thus, 15 is to do with pleasure in rationality. Another essential principle of harmonic astrology is that the closer an aspect is to exactitude, the stronger it is. The permissible orb for any aspect is the orb for the conjunction, divided by the number of the aspect. Thus, if we say that the maximum orb for a very close (i.e. very strong) conjunction is 2 degrees (=120 minutes), then the maximum orb for a very close quintile is 120 divided by 5, i.e. 24 minutes, and the maximum orb for a very close “twentieth” aspect is 120 divided by 20, i.e. 6 minutes. One disadvantage of harmonic astrology, as it was set out in my book, is that it entails drawing a number of harmonic charts, each of which can come to seem like a separate entity, when really it is just an artificial way of looking at some features of the original chart. To overcome this, I am now working on a book (provisionally entitled Astrology and the Meaning of Numbers) in which I will describe a method of identifying the harmonic aspects without having to draw the harmonic charts. It would take too long to describe this method here, so readers of this article will have to take this on trust. (c) The angular distance from Moon to Jupiter is one-twentieth (or a higher number of twentieths) of the circle. 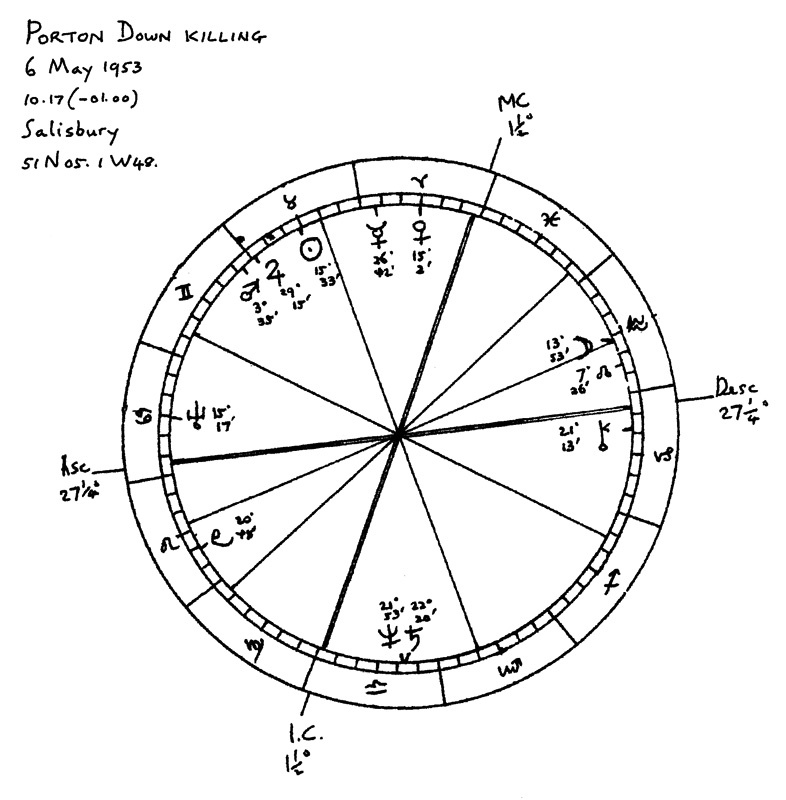 Now that we have described the system, we can go back to looking at the charts of Tony Blair and the Porton Down killing, to see what aspects (and clusters of aspects) are dominant in the charts. In fact, the pattern of aspects is very nearly the same in the two charts. This would not be the case for aspects involving the Moon, since the Moon moved 2 ½ degrees in the four hours between Blair’s birth and Maddison’s killing, and this is enough to radically alter the Moon’s aspectual links with other planets. But it happens that, in both of these charts, there are no really strong harmonic links involving the Moon. (This is an important finding in itself, suggesting that, for both Blair and the Porton Down scientists, the Moon-nature – the receptive, sensitive, reactive side – is relatively weak, or is isolated from the rest of the personality. This may have helped the scientists to remain firm in their purpose in spite of Maddison’s death agonies, just as it helped Blair to remain firm despite the two million people who demonstrated against the Iraq war.) Because of this lack of Moon-links, we can, for the sake of brevity, treat the two charts as if they were the same (though a more detailed analysis would need to take account of subtle differences between them). Firstly, SA-1-NE (a very close conjunction of Saturn and Neptune). This is of course a long-lasting aspect, valid not only the day in question (6th May 1953) but over a period of several weeks. Neptune speaks (among other things) of hopes, expectations, visions of the future, but Saturn speaks of these hopes being held in check by difficulties and restrictions. Looking at what was happening in the world in early May 1953, I get the feeling that this was very much a period of deferred hope. Stalin had recently died, and Georgy Malenkov had taken over as Soviet leader; people were hopeful that this would lead to a relaxation of Soviet intransigence and to a rapprochement with the West, but as yet there were no real signs of this. Sir John Hunt’s expedition was climbing Everest (which they were to conquer on 29th May), but in late April and early May they were held back by bad weather and unexpected difficulties. In Britain, people were looking forward to Queen Elizabeth’s coronation, but this was nearly a month away. There is a sense of frustration: things are going to happen, but nothing is happening yet. However, on 6th May Saturn and Neptune were opposite Mercury and square to Chiron. These aspects speak of a determination to break out of the frustration by means of rational action, and to do something to “save the world” (Chiron in its role as healer). Certainly one can see this in Tony Blair’s personality: one feels that he saw himself as a “knight on a white charger,” riding in to save the world from Saturnian repressions. This may have contributed to his impatience (we have to invade Iraq now, we can’t afford to wait). Maybe something of this spirit was also present in the Porton Down scientists. “Striving to love originality: striving to attract others by one’s uniqueness, vivacity and unpredictability: striving to repel those who do not accept one for these qualities: striving for adventure in love, and for unconventional and sharply-defined value systems: tending to withdrawn-ness and taciturnity if these expectations are not met: the search for a vivid and thrilling beauty” (6). Whether any of this was true of the Porton Down scientists as well as of Blair, we can only guess. But Venus is about the search for beauty as well as for love, and, if it is linked with Uranus, it is (as I said above) about the search for a “vivid and thrilling beauty”. This puts me in mind of someone lighting a firework display, and revelling in the awesomeness and brilliance of the display; and we must remember that the most brilliant firework display of recent years was that above Baghdad at the time of the American/British invasion, which was described at the time as a spectacle of “shock and awe”. It seems possible that (whether consciously or subconsciously) Blair was attracted to this kind of awesome display, this brilliant, shocking and electrifying way of solving problems by a single stroke of dynamic action..
And it is possible that something similar was happening at Porton Down. Maddison was not the only volunteer to be given a dose of sarin, but it is probable that he was given a larger dose than any of the others. Possibly, on 6th May 1953, under the influence of VE-4-UR, the scientists said to one another, “Today, let’s go for the big one”. And Maddison’s death agonies, as described by Alfred Thornhill, were another spectacle of “shock and awe”: the kind of thing that, once one has witnessed it, can never be forgotten. It is the attraction of horror, which many people satisfy through horror films, but which is even more compelling if witnessed in real life. And there is another cluster which still further increases the importance of VE-4-UR. This is (VE-4-UR)-12/6-SO (i.e. Venus is semi-sextile to the Sun, and Uranus is very closely sextile to the Sun). Close aspects to the Sun are always important, because the Sun represents the individual’s view of himself or herself in this incarnation: what he or she wishes to achieve in life, and how he or she wishes to be seen by others. So this close Sun-Uranus sextile in Blair’s chart shows that Blair sees himself as someone who obtains pleasure through striving (6 = 3 x 2) to act in Uranian ways: that is, in dynamic, original, unpredictable ways. The question for Blair is: How can I show the world that I am different from other people, that I am a unique and remarkable person? This makes him something of a loner: although he became leader of the Labour Party, he never seemed to really “belong” to the Party or to share its values. The people who were closest to him were always “Blairites” rather than Labour Party stalwarts. And this will have helped him to strike out on his own on the Iraq question, and to follow a course of action which was against the Party’s instincts. And yet SO-12-VE shows that this is linked to his need to be loved: it still pains him when people fail to follow his lead. In the case of the Porton Down scientists, it is more difficult to interpret these aspects. Maybe, on this day, they felt that their research was running into the sand, and that they needed to take some dramatic and risky action in order to rescue their self-esteem. Maybe this was partly what inspired them to give Maddison a dosage of sarin that turned out to be lethal. In Blair’s case, I would suggest that these aspects are linked, not only to his deceitfulness about Iraq, but to his whole addiction to “spin”: that is, to the weaving of stories around events which deflect people’s attention from the true nature of those events. And this takes us on to another “Fiveness” aspect: SO-20-MA. 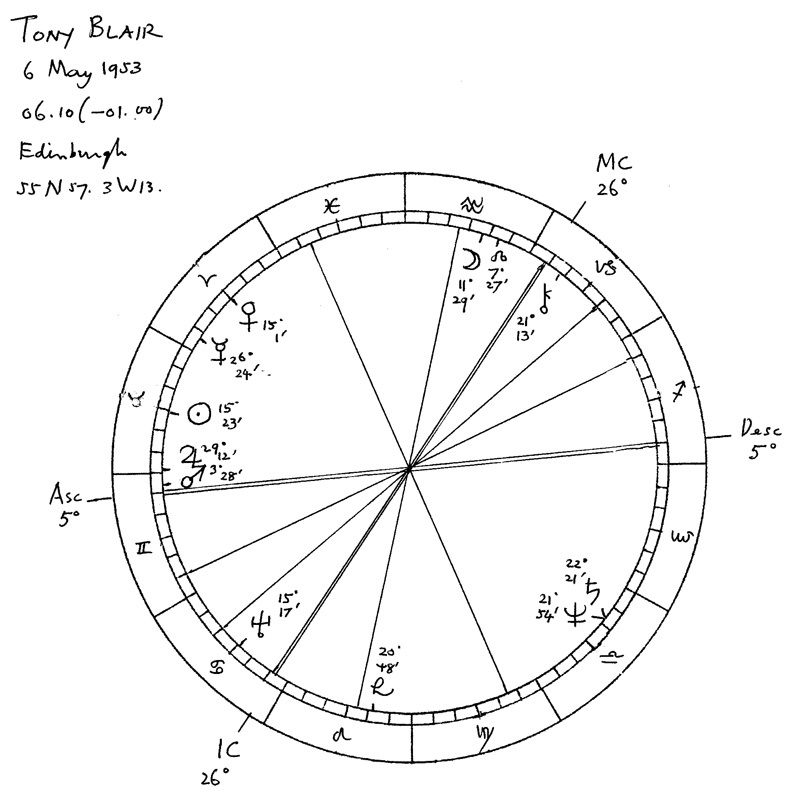 Here again we have a very close aspect involving the Sun, and it is particularly emphasized in Blair’s chart because Mars is close to the Ascendant. SO-20-MA shows that Blair identifies himself as a person who is striving to find forceful (Martian) ways of expressing himself in the world, and of imposing his will upon others. Because it is a “Fiveness” aspect, it will tend to lead to the setting up of systems for the purpose of distorting the truth and ensuring that one’s version of events is accepted. Blair’s right-hand man, Alistair Campbell, was very much the personification of this approach, but the chart shows that it was present in Blair’s own make-up. SO-20-MA and (VE-4-UR)-20/10-PL are in fact part of a complex pattern of Fiveness in Blair’s chart (and the Porton Down chart), involving some other Fiveness aspects besides those listed here, and showing that Fiveness is very strong in Blair’s personality. Many people have commented that Blair is essentially an actor, greatly concerned with self-presentation, and having many skills that enable him to present himself in a favourable light. These are very much the skills of Fiveness. The last aspect that I wish to consider is MA-14-PL. This is the only strong “Sevenness” aspect in the Blair and Porton Down charts, and again it is especially emphasized for Blair because his Mars is close to the Ascendant. Sevenness is to do with what inspires one or “turns one on”. In my book I suggested that Sevenness aspects between Mars and Pluto mean that one is “inspired by programmes of action that are ruthless, hard and uncompromising” (7). In the context of the Iraq invasion, one can see how this could lead to a belief that the enemy (Saddam) should be dealt with ruthlessly, and that the difficulties and objections should be swept aside. To put it bluntly, it suggests that Blair was inspired by the idea of war. I believe that these harmonic aspects go a long way towards explaining why both Blair and the Porton Down scientists felt impelled to launch an unprovoked attack which led to the loss of innocent life. But this is not to condone their actions. They knew, or should have known, that what they were doing was wrong. They should have pulled themselves back from the brink, but they failed to do so. And I would like to turn, finally, to the question of legality. Fifty-one years after the event, the killing of Ronald Maddison was declared to have been illegal; but no criminal prosecutions followed, presumably because those who were responsible for Maddison’s death were already dead. It seems quite likely that eventually – maybe after 51 years – the invasion of Iraq will be declared to have been illegal under international law, and Tony Blair and George Bush will finally be branded as war criminals. But they will not be prosecuted, because they will be dead.